Been busy with Navy stuff these past few months, so haven't had time for updates until now. I haven't even fired a gun since visiting 29 Palms, CA back in October 2013 and it's driving me crazy. Ever since I bought my first Mauser Broomhandle back in 2009, I've had a weird obsession with all things 7.63 Mauser. Specifically, it was the Star Model A that caught my eye. Maybe it's the neat cartridge it comes chambered in, or maybe it's the Colt 1911-like ergonomics, but I just always wanted one. Plus I always had a thing for a pistol with a shoulder stock. Since 2009 I've been using GunAuction's "Auction Recon" feature to alert me in the event that a Model A should show up for sale, but I haven't found a single one yet. I wasn't really serious about buying one at that point anyways. Last year I happened across a mysterious combination shoulder-stock/wood holster for a mere $75. I bought it on a whim and discovered it was actually a rare Star Model A shoulder stock - it was fate! I knew at that point I needed a Star Model A to help complete my collection of NFA-exempt stocked pistols. I've been searching for a Star Model A Pistola or Carbine more rigorously since. Either one, any one, chambered in 9mm, 9mm Largo, or 7.63 Mauser, with or without tangent sights. I see these selling on GunBroker for $1300 for a well-used specimen, and up to $3000-$4000 for a pistol in 95% condition, with or without the shoulder stock, but I'm not willing to pay that much. Since GunBroker doesn't keep records of old sales, I did a price comparison on GunAuction and it seems that these guns sold for well under $400 ten years ago. I wonder what changed? More recently I came across a seller on eBay who was selling a slide and some small pieces of a Star Model A. I inquired about the frame and managed to talk him into selling the frame and slide to me. The whole lot was soon transferred home to Texas where it belongs. Disregard that pin thingy on the right. I'm not sure how I'm going to go about fixing it. I already knew that parts would be impossible to find for this. I've been told that cheap surplus Star Model B parts are compatible with the Model A. I already have most of the major components, so all I would really need is the recoil spring assembly, the safety and slide release, magazine, hammer spring, and barrel. I think sacrificing a Model B to save a Model A is a fair trade. The grip panels I believe are the same as a model B. It's just flat-shaped wood that's slapped on there and held in place with two screws, right? As for the barrel, a Model B barrel (if it actually fits) can be bored through, relined to.308, and rechambered for 7.63 Mauser. Pretty sure I'm never going to run across a rear ladder sight by itself, like, ever, so my only hope for that is to just find a complete slide assembly on ebay and part that out. Bonus: I recently tracked down a much nicer shoulder stock which I estimate to be in 95% condition (in my non-expert opinion). It looks pretty new. As far as I know, the Chinese (nor anyone else, for that matter) didn't manufacture copies of these like they do with Broomhandle, Luger and HiPower stocks, so I'm pretty certain this is original. The seller is from Spain and doesn't even English, so I dunno if I just spent $100 on a screw or an actual complete stock, but to the left is a picture of what I believe I just purchased, so I'll just have to wait and see if it actually arrives! It's also interesting to note how very little information, pictures or video there are out there on these weapons. Sure, there are a few pictures of a Star MMS and Star Machine Pistol, but below is the only example of a complete Star Model A with shoulder stock and rear tangent sight I could find. This is what it should look like when it's all said and done. www.9mmLargo.com - Everything you need to know about the 9mm Largo round, which includes the Star pistols. Star Bonifacio Echeverria, S.A. - Information on all weapons manufactured by Star. Wikipedia Entry - History of Star Bonifacio Echeverria S.A.
ATF's Curio and Relics list - A list of C&R weapons, including pistols with accompanying shoulder stocks, which are exempt from the 1934 National Firearms Act. 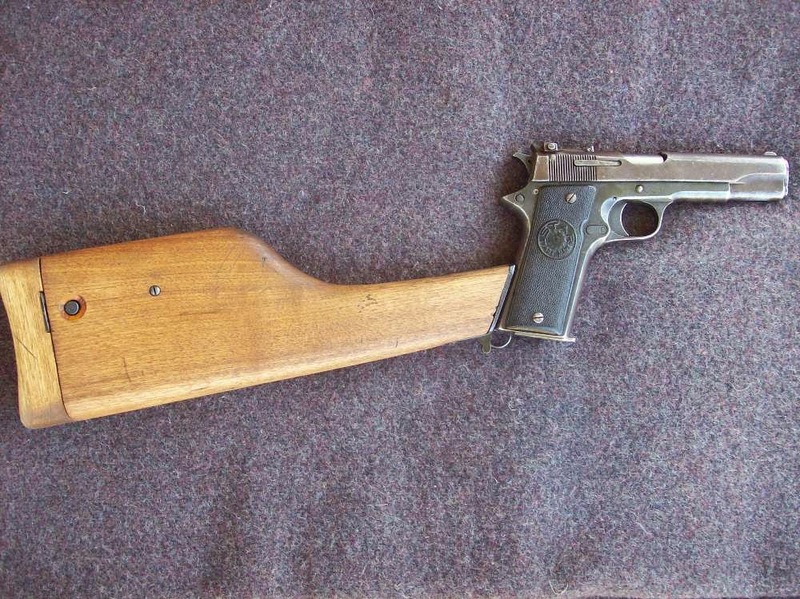 Do you still own the $75 stock for a Star Model A pistol carbine? Mine pistol needs a stock. Hello, unfortunately I no longer have the old one. I did see a few more of these turn up on ebay in the past year, so they're not super rare or anything. And often times people on online auctions sites mistakenly list these as Mauser or Browning Hipower stocks or just "Unknown pistol stock." An easy way to differentiate them is the attachment rail sticks out noticeably further on the Star stock. Good luck. Are the MMS pistols also NFA exempt? I have no idea. I've seen some auctions say you need NFA tax for it, and some don't even mention it. ACP and 45 ACP, accompanied by original Spanish mfd. detachable wooden holster/shoulder stock"
As far as I can tell, there is no such thing as .45 ACP Star Model A. There IS a .45 ACP Star Model P. If the ATF considers a Model P synonymous with the Model A, then I guess a MMS can be synonymous with the Model A, also.